Prepare to be ravished, New York City: Sander van Doorn is making his return to the heart of Manhattan on Saturday, November 14. The legendary DJ/producer will treat NYC with a nightclub DJ set, which are always anticipated from the multifaceted Dutch talent. Van Doorn has become familiar to electronic dance music (EDM) enthusiasts for his solo productions and classics releases under his aliases Purple Haze and Sam Sharp. With two studio albums under his belt—Supernaturalistic (2008) and Eleve11 (2011)—van Doorn Sander’s extensive discography is also loaded with notable collaborations (Marco V, Dimiti Vegas & Like Mike, Martin Garrix) and remixes for countless artists (Sia, Armin van Buuren, The Killers, OneRepublic, Lady Gaga). This year alone, Sander has released a plethora of new material, including “Rage” with Firebeatz and Julian Jordan, “Pheonix” with R3hab, “Ori Tali Ma,” “Oh Amazing Bass,” “Output (Sander van Doorn Edit)” with The Alexsander, “ABC” with Sunnery James & Ryan Marciano, and “Lost” with MOTi. *Contest ends Fri., Nov. 13 at 10 pm EST. Winner will be randomly selected and notified by email on Friday by 11 pm EST. 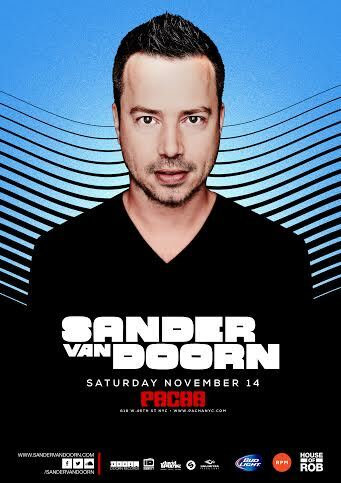 Tickets for Sander van Doorn at Pacha NYC on Nov. 14 are available HERE.